Edinburgh based boutique Spirits Company Wemyss Malts is delighted to announce that it is celebrating a third World Whisky Award from Whisky Magazine as Best Blended Malt Scotch Whisky 2015. This year's winner is "Velvet Fig", a limited edition launched in late 2014. Only 6000 bottles were available and the whisky was bottled at 46% abv and non chill-filtered. 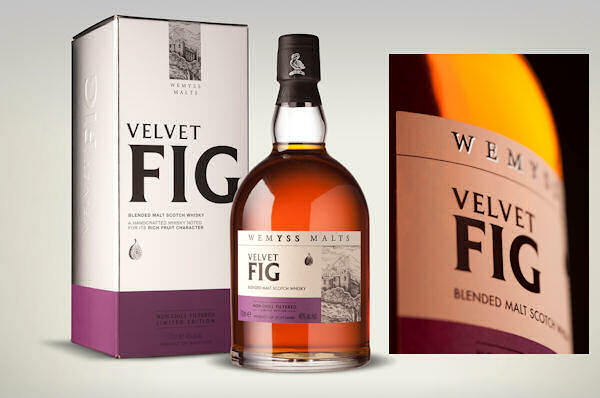 Like the rest of the Wemyss Malts blended malts selection, "Velvet Fig" is named after the whisky's natural flavours and aromas. The natural mahogany colour has a depth and richness that comes from the quality sherry casks selected. The generous nose is abundant with rich fruits bound with sweet mead and warm leather. The palate has luscious golden sultanas, soft fig and Medjool dates, spiced with nutmeg and ginger and yielding sweet chestnut and toasted walnuts in the finale. Wemyss blended malts have collected World Whisky Award for best blended malt Scotch twice before: “The Hive” in 2012 and "Spice King" in 2013. "Peat Chimney" collected the bronze award in 2014.